Trump event touted 'made in America' goods. A lot of his merchandise couldn't be featured. The president and his daughter largely manufacture Trump-branded products in countries like China, Indonesia, Turkey and Canada. President Donald Trump on Monday hosted his second White House event to promote American-made products — this time as trade battles loom. "We’re here today to celebrate the greatest products in the world, products made with American heart, American sweat, and American pride," Trump said at the event that featured large companies like Ford and Lockheed Martin, as well as a smaller businesses that make things like pens, puzzles and clothing. The White House billed American-made goods as "a global symbol of unrivaled excellence." But many of his own products wouldn't fit that bill. The president and his daughter largely manufacture Trump-branded products in countries like China, Indonesia, Turkey and Canada. Here's where Trump products are made. "Unfortunately, my ties are made in China," Trump admitted in June 2016. Trump suits sold on Amazon.com are listed as imported. Buzzfeed ordered two; they were made in Indonesia. Trump rectangular shaped eyeglasses are made in China, according to retailer eyeglasses.com. However, Trump's cologne line, 'Success,' is made in the U.S.A., according to the labeling. Late night television host Jimmy Kimmel went on a shopping spree on the official TrumpStore.com, and found a slew of products made in other countries. A white golf hat was made in China, while a Trump mug was made in Thailand. A shoe bag and duffel bag were made in China. A toddler bib he ordered was made in Peru. A Trump collector medallion was made in China. Kimmel also said that two products he ordered — a pet bandanna and a gold block — did not have a country of origin listed on the product or its materials, something that is illegal. The lone domestic find? A golf club cover that was made in China, but decorated in the United States. Trump Vodka was first announced in 2005. "I fully expect the most called-for cocktail in America to be the 'T&T' or the ‘Trump and tonic," Trump said in a release at the time. It was manufactured in the Netherlands and later Germany. When financial troubles ended U.S. sales, Trump signed a deal to sell it in Israel, Bloomberg reported. Who is really winning from President Trump's tax cuts? There are two Trump-branded domestic beverages, however. Trump's spring water is bottled in Vermont and New York, while the Trump family winery is in Virginia. 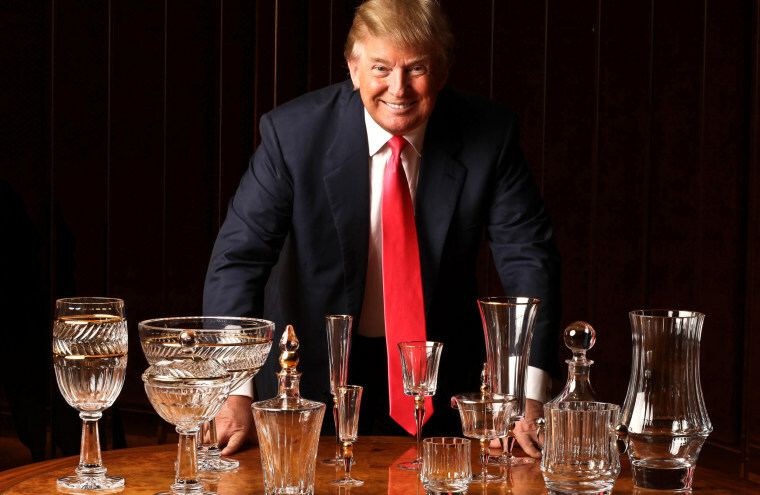 Trump's line of crystal glasses, decanters and more was made in Slovenia. The crystal line appears to be defunct. "I've seen factories over there, their glass and crystal works are unbelievable," Trump told The New York Times in 2010, eight years after his one and only visit to Slovenia which lasted, reportedly, just three hours and did not include a factory visit. In 2014, Trump teamed up with Turkish furniture company Dorya to release Trump Home by Dorya. The company expanded the furniture line a year later, and a Trump website says it is available internationally, though products could not be found online. Brass and steel parts were made in Germany, and wood and upholstery production was done in Turkey, according to Furniture Today. Many of the products used in Trump hotels are from overseas. The Trump-branded bedding is a mixed-bag. Take this comforter, for instance: The shell is made in China, while the filling and assembly is completed domestically. The matching pillows are begun in China and finished in the U.S.
USA Today reported that his new Washington hotel has chandeliers are from Austria, hallway lamps from China, phones from Malaysia, televisions from South Korea, towels from India, plush robes from China and glasses from Italy. The mattress and pillows, it was noted, are American-made. Many Trump-branded products sold in the gift shop of the Washington hotel are made overseas, too. The Daily Beast reports that a $32 golf hat is made in Bangladesh, a $50 Trump-branded fleece is made in Pakistan, and an $80 pullover is made in Vietnam. A $15 Trump conditioner and a $15 Trump body butter both listed Canada as its country of origin. Trump's official campaign gear is all made in the U.S. The 'Make America Great Again' hats, for instance, are made in Southern California. At last year's "made in America" event, the White House defended the president's daughter and senior adviser Ivanka Trump after an investigation by The Washington Post found that her namesake clothing and accessories brand relies exclusively on factories in Bangladesh, Indonesia and China. "There are certain things we may not have the capacity to do here in terms of having a plant or a factory that can do it. The beautiful thing about a capitalistic society is if there's enough of a demand for it, it will happen," then-White House Press Secretary Sean Spicer said last July.